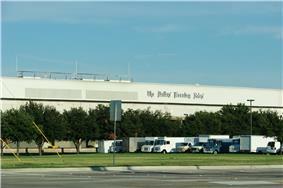 The Dallas Morning News is a major daily newspaper serving the Dallas, Texas area, with over 400,000 daily subscribers. It was founded on October 1, 1885, by Alfred Horatio Belo as a satellite publication of the Galveston Daily News, of Galveston, Texas. Today it has one of the 20 largest paid circulations in the United States. Throughout the 1990s and as recently as 2010, the paper has won numerous Overseas Press Club award for photography. The company has its headquarters in Downtown Dallas. The Dallas Morning News was founded in 1885 as a spin-off of the George Dealey. In late 1991, The Dallas Morning News became the lone major newspaper in the Dallas market when the Dallas Times Herald was closed after several years of circulation wars between the two papers, especially over the then-burgeoning classified advertising market. In July 1986, the Times Herald was purchased by William Dean Singleton, owner of MediaNews Group. After 18 months of efforts to turn the paper around, Singleton sold it to an associate. On 8 December 1991, Belo bought the Times Herald for $55 million, closing the paper the next day. 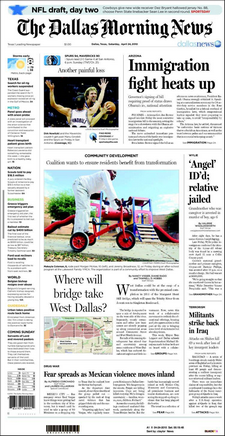 In April 2005, The Dallas Morning News launched four editions of a weekly community newspaper called Neighbors. In April 2007, the publication was rebranded as neighborsgo and a website, neighborsgo.com, was launched. As of August 2011, neighborsgo published 11 weekly print editions and was distributed to more than 340,000 households in the Dallas area. Gelsanliter, David (1995). Fresh Ink: Behind the Scenes of a Major Metropolitan Newspaper. Reed, Roy (September 1998). "State of The American Newspaper: Giant".